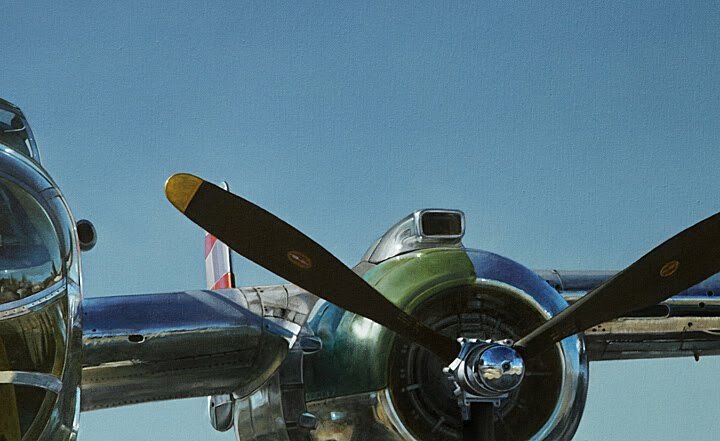 The B-25 is complete. 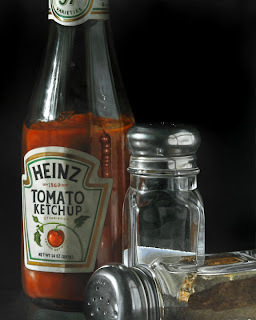 I can't believe I was able to finish it in time for the Realism Show at Mason Murer. Opening night reception is April 8th, and this should give me enough time for the painting to dry and maybe get a coat of varnish on it as well. This is by far the largest and most complex painting I've ever done, and I have to say, I've developed a taste for large and complex. I really hope there's a market out there for something like this because I'd love an opportunity to paint this subject much more often. 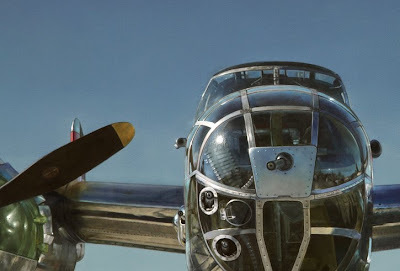 Even though my career as an aircraft mechanic only lasted a few years, I could easily imagine myself in the presence of this plane as I was painting it. All the sights, sounds and smells of working on the flight line came back . . . and it was great. I still kind of miss it. Now it's time to reduce the scale and get back to work for the July show at Tree's Place on Cape Cod. I'll be shipping them the first five paintings within the week, and should have an image of their sixth painting ready to post in the next few days. Karen and I have been working together to assemble a collection of her WindowScapes paintings into a book. We used blurb, an online book creation/publication website that I used for my first book, Paintings in Oil. Her "proof" copy arrived a few days ago, and it's top notch. I don't know how blurb does it so much better than other book creation sites, but the images are a spot on match to the originals. 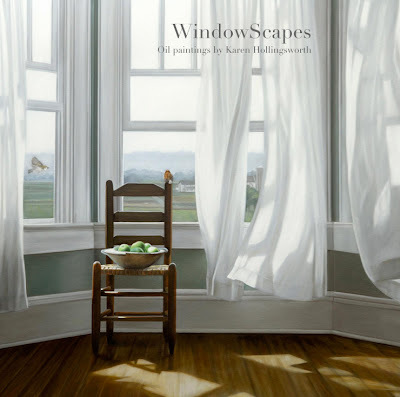 It's a 12 x 12 inch hardback book with a dust jacket and contains 39 of Karen's favorite windowscapes paintings. If you'd like to preview the entire book and make a purchase click here. 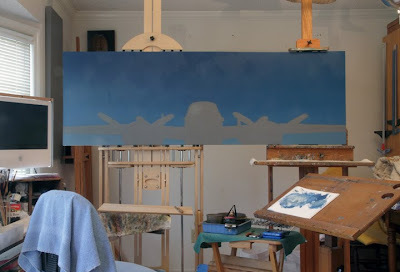 Finished up the underpainting of the fuselage last night, which completes the first pass. Eight days in so far. I'm really working hard on this one trying to stay ahead of the deadline. Not sure at this point if I'll make or not, but doing what I can. One possible scenario, it may have to go to the gallery wet and unvarnished. Worse case scenario, it's not done. Back to work on the sky today, and if I'm lucky I'll be able to spend some time on the right wing as well. This may be the last of the in progress shots. I don't think the changes will be pronounced enough to justify further posts. I'll probably hold off and post a high quality jpeg of the final painting when it's complete. Days four and five on the B-25. One day each on the underpainting for the engine nacelle's. Today I'll start work on the fuselage. When I've got that done, I'll probably do the second pass on the sky, then return to the wings for their next pass. Day three on the B-25. Finished up the underpainting on the wings. Now it's on to the engine nacelle's and props, then the fuselage. For people who regularly paint large this wouldn't appear all that impressive, but for me gazing upon a canvas that requires two easels to support is a pretty daunting scene. This piece also comes with the added pressure of a deadline. It has to be completed in three weeks if it's to be ready for the Realism show at Mason Murer on April 8th. Suffice it to say, I'm freaking out. On the other hand, this is a subject I've wanted to paint for ever. It combines my love of flying and vintage aircraft with my love of painting. One more side note about the Realism show, my nephew called the other night to tell me that he saw my Mule No.2 in an ad in Atlanta magazine promoting the show at Mason Murer. Karen and I went out the next day and picked up a copy. Andrea at the gallery creates all their ads and she did a great job. She's got a great eye for design and the use of type. It's wonderful seeing my paintings in print. I still can't believe that I get to do this for a living. It took fifty years and three previous career moves, but it was worth the wait. I am really tempted to continue on and work this one to death, but Karen says, "it's done, move on". If I didn't have a deadline on the next painting, I'd probably override her suggestion and keep refining it. I'm sure she's right. The added work I'd put into this one would probably be lost on everyone else in the world. I had some trouble getting a good photo of this one. It's a bit darker than in person, but it's close. Now it's onto the next piece. Hopefully I'll have an in progress shot in the next few days. On some occasions the first pass of a painting comes very close to a completed piece. At least it appears that way in the image I post here on my blog. In the flesh, they do look more distinct. Stacked Blocks is a good example of this. The in progress image and the jpeg of the completed painting look very similar on the computer monitor, but the finished painting is, in actuality, much more developed. 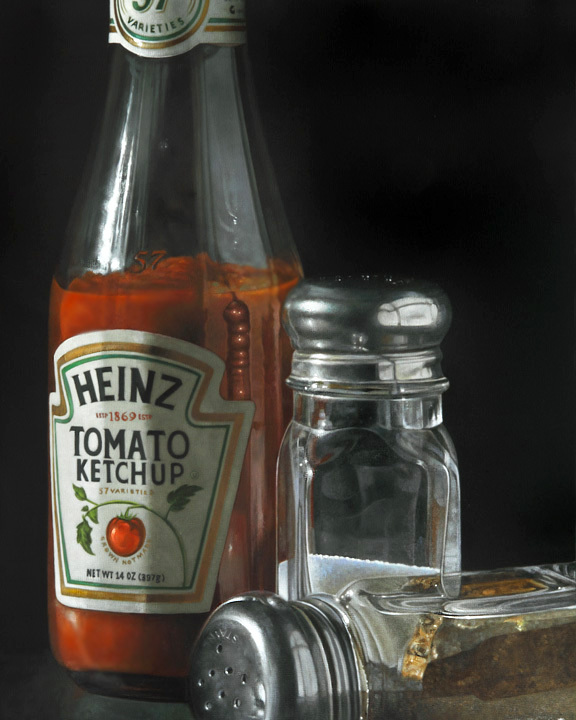 I've been working on the second Ketchup Bottle for the last few days and I'm facing that same situation with it. Any in progress post at this point would be very hard to discern from it's predecessor, so I'm holding off until it's complete to show the final pass. My next painting will be a very large and complex one and I think it will work better as an in progress piece. If it takes as long as I think it will, you may all be pretty sick of seeing it by the time it's done.